Irish Portrait Painter and War Artist: Biography, Portraits. One of the greatest painters in the history of Irish art, Sir William Newenham Montague Orpen, was a skillful and sympathetic Irish portraitist of the traditional school of academic art. During a lifetime devoted to portrait art, he painted about 600 portraits, including those of David Lloyd-George (British Prime Minister), Woodrow Wilson (US President) and Sir Douglas Haig (British commander in WWI). Born in Stillorgan, County Dublin, the son of a solicitor, William Orpen studied drawing and painting at the Dublin Metropolitan School of Art and later figure drawing and figure painting at the Slade School of Art in London under Henry Tonks, where he studied the Old Masters, with particular emphasis on portraits from the Renaissance, Baroque, Neoclassical and ninteenth century eras. He quickly developed into an excellent draughtsman and achieved rapid initial success, establishing himself in London among the rich as a much sought-after portrait artist. In 1910 he was elected an associate member of the Royal Academy of Art. Although his art studio was in London, he also spent time in Ireland and influenced (among others) the Irish realist painter and portrait artist Sean Keating. After the outbreak of the First World war, Orpen, like John Lavery, was appointed an official war painter and given the rank of Major. During his stay on the Western Front, he completed numerous drawings and paintings of private soldiers as well as official portraits of generals and politicians. Other notable paintings included Dead Germans in a Trench, Members of the Allied Press Corps, and Ready to Start. Most of these paintings now hang in the collection of the Imperial War Museum in London. Following the armistice Orpen was made official portrait artist to the Versailles Peace Conference, where he completed several works including for The Signing of the Peace. Orpen was deeply affected by the suffering he witnessed in the war. His feelings and misgivings about the treatment of common soldiers was evidenced by his painting To the Unknown British Soldier Killed in France, first exhibited in 1923. This picture portrayed a flag-draped coffin flanked by a pair of ghostly and wretched soldiers clothed only in tattered blankets, set against the opulent backdrop of the Paris Peace Conference. Although the work was widely admired by the general public, it was attacked by the authorities and Orpen was forced to paint out the soldiers before the picture was accepted by the Imperial War Museum. In 1919 (before he produced his controversial painting), Orpen was elected a member of the Royal Academy and returned to his portrait painting practice and continued painting London's elite, including the British wartime Prime Minister David Lloyd-George (1926). Some of his post-war portraits are viewed by art critics as perhaps rather shallow. If true, it is attributed to the effect of his wartime experiences, after which nothing really mattered. 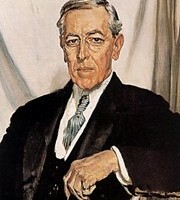 Orpen died in 1931, aged 53. He remains one of the most influential and highly valued Irish artists by collectors and other portraitists. For details of the value of his works at auction, see: Most Expensive Irish Paintings. The auction record for a work by William Orpen was set in 2001, when his painting, entitled Portrait of Gardenia St. George With Riding Crop, was sold at James Adams, in Dublin, for £1,983,500. In 2003, Orpen's Portrait of Mrs St. George sold at Sotheby's for £924,000.  For details of other portraitists from Ireland, see: Irish Artists: Paintings and Biographies. 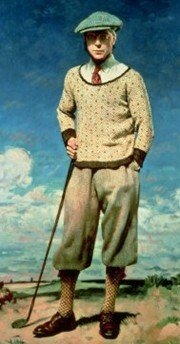  For more about portrait painters from Ireland like William Orpen, see: Irish Art Guide.